Are you checking your email too frequently? Probably...! 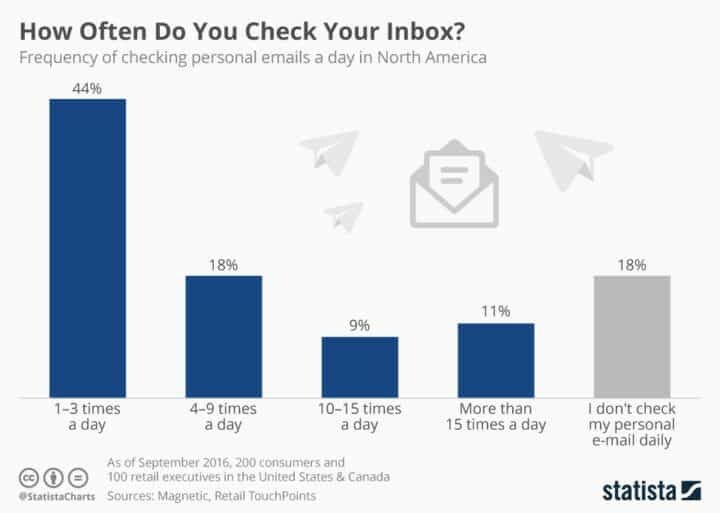 Nearly four in every ten people are checking their personal email account between four and 15 times each day. One in every ten is checking their personal email account more than 15 times a day. That’s their personal email, not their business account. In addition to work-related email, a significant number of people are logging onto their personal email accounts around once every 40 minutes during the working day. These figures come from a study of retail executives in the USA and Canada, but they are probably typical of other sectors. The majority of office workers are checking their personal email accounts several times a day. What if the researchers had asked a different question? What if they had asked, how many times a day do you check the voicemail on your home phone? Or how many times a day do you go home to check if there is any post that has been delivered in the mailbox? The participants would have probably answered, “that would just be silly”. Yet, it isn’t thought “silly” to check personal emails multiple times a day. It seems that most office workers think it is either OK or necessary to keep checking their personal email accounts. Yet this is a distraction. Indeed, so is checking business email accounts. Constant checking and re-checking of email accounts can lead to lower productivity. So why do people keep checking their email? One reason why people keep checking their email accounts is because it provides an instant rush of dopamine, the reward chemical that makes you feel good. However, because seeing an email gives you some dopamine, you quickly learn that to get more dopamine you need to look at your email again. The more emails you get, the more you check the accounts because it inevitably leads to more and more dopamine. Before you know it you are hooked on email. An email-dopamine-tolerance loop exists. You check your email a couple of times a day, get a dopamine high, that tells your brain to check for more emails, so you get more dopamine. But you then get used to the high levels of dopamine, so you need to check more often. Reducing your reliance on dopamine means you need to lower your resistance to the chemical, allowing it to produce the highs with less stimulation. There are several rather simple ways you can do this. Reduce your caffeine intake. Caffeine is a stimulant that is involved in inducing dopamine. Lower your caffeine and your dopamine system benefits. Exercise. People who are physically active tend to have lower dopamine levels. Simply going for a walk each day could be enough to help your dopamine reliance. Relax more. Getting more time to yourself, without your smartphone in your hand, will help to reduce your stress levels. Meditate or read a book – anything that will help you relax. Doing so will lower dopamine. Work to a routine. People who have regular routines and schedules tend to have lower dopamine levels. If you check your emails according to a strict routine your dopamine system will benefit. People who check their email once or twice each day are shown to be much more productive than people who constantly keep an eye on their emails. It is false to think that you have to regularly check emails, otherwise, you will miss out on important information. It turns out that in offices where people only check email according to a routine, productivity is higher. That’s because the email users do not need another “fix” of email reading. Their dopamine system is better balanced, meaning that they do not need the constant surge in dopamine from another quick check of their email account. Not only will you be more productive if you check your email according to a routine, but you will be mentally fitter and healthier too.